UV radiation from the sun and tanning beds is made of UV-A and UV-B radiation. UV-A has a longer wavelength and is slightly lower in energy; it penetrates deep into the skin. UV-B has a shorter wavelength, but doesn’t go as deep. UV-B is responsible for superficial burns. Both types, however, contribute to skin cancer. What do the data say about tanning and risk? A recent report by Boniol and colleagues aggregated nearly 30 studies over three decades to study the risk of developing melanoma, an aggressive type of skin cancer. For people under 35 who reported using a tanning bed, the risk of melanoma development increased by at least 20%. In some studies included in the report, risk of melanoma nearly doubled—a 100% increase. Risk depends on a variety of factors. For example, fair-skinned individuals are more likely to develop melanoma because of less melanin production. With less melanin, less UV radiation is absorbed, and more is free to cause damage. However, just because a person produces melanin readily and tans easily does not mean it is safe to tan. A person who produces a lot of melanin may have a lower risk, but tanning still increases the risk. It’s like saying a person who smokes five cigarettes a day is less likely to develop lung cancer than a person who smokes 20. That’s true, but both have increased their chances of getting lung cancer. Medical professionals agree that no matter a person’s skin tone, tanning is directly linked to increased incidence of melanoma. Nearly 75,000 cases are documented per year in the United States alone, and they will be responsible for almost 10,000 deaths. How does tanning lead to skin cancer? When UV radiation reaches the skin, either superficially or deep, it penetrates into the cells all the way to our DNA. Once it’s there, it needs somewhere to go. Unfortunately for us, there is a chemical bond called an ethylene bond within a fundamental structure of our DNA, and this type of bond readily absorbs UV radiation. When this happens, the energy of the electrons within the bond increases enough to accidentally form a new bond in an area where it’s not supposed to be. This creates a foreign structure called a “pyrimidine dimer.” Our cells try to fix this but don’t know what to do with these pyrimidine dimers, so they “guess”— oftentimes putting the wrong sequence into our DNA. 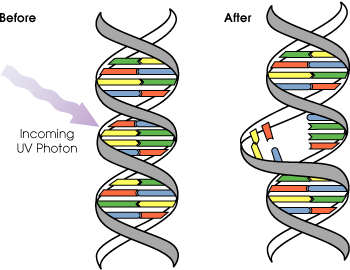 This is how we get mutations resulting from UV exposure. If the mutation occurs in a dangerous region of DNA, cancer begins. 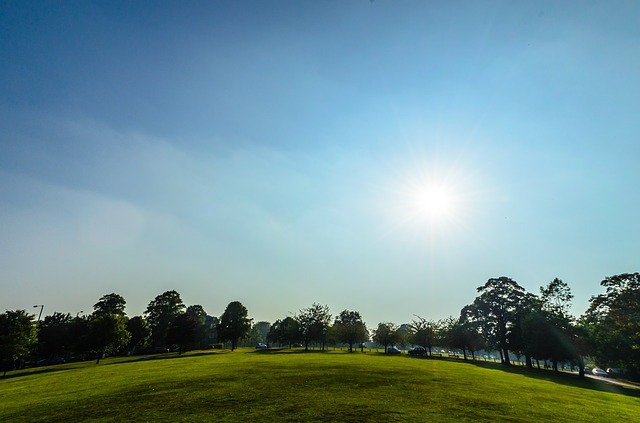 UV radiation also causes dehydration and forces the body to expend lots of energy trying to repair damaged cells, forcing the immune system into overdrive. UV radiation also damages the immune cells themselves, meaning there are now fewer cells trying to do much more work. This explains why people often feel sick or sleepy after sunburns. To add insult to injury, with an overworked, understaffed the immune system, cancer cells cannot be detected as readily, increasing the likelihood that a tumor will develop. Putting these two pieces of the puzzle together, we see that UV radiation can be very detrimental to our health. This does not mean everyone who tans will get melanoma, and it does not mean everyone who doesn’t tan will not get melanoma. However, it does mean that every time someone tans, his or her chances of getting melanoma will increase regardless of whether that person “tans easily.” It’s simple mathematics: the more mutations you introduce, the higher the chance a cancerous one will occur. Are there any benefits of UV radiation? UV radiation does produce vitamin D, which is very beneficial. Studies have shown that vitamin D can lower blood pressure, reduce the risk of diabetes, and improve bone and colon health, among others. However, it is just as easy to get vitamin D from a supplement, which eliminates the risks associated with UV exposure. Should we go outside in the sun at all? It’s true that UV radiation from the sun is dangerous, so does this mean people should avoid the beaches and stay inside all summer? Of course not! Being out in the sun is fun and good for our psychological well-being. It also lowers stress and encourages us to be more physically active. Just remember to bring an umbrella to the beach and wear sunscreen. Pick a sunscreen with an appropriate SPF that protects from UV-A and UV-B radiation. SPF (sun protection factor) is a measure of how much UV radiation reaches the skin. For example, SPF 15 lets only 1/15th of the UV radiation through to the skin. Everyone should use SPF of 15 or higher, and fairer-skinned individuals should generally use SPF 30 or higher. If you still want that bronze glow, consider an artificial one from a lotion or a spray. Otherwise, it’s best to just protect the skin you have. 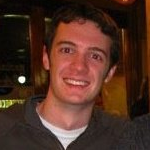 Ross Keller is a 4th year PhD candidate in the Biomedical Sciences Graduate Program. He works with Dr. Edward Gunther in the Gittlen Cancer Foundation where he studies how genetic mechanisms contribute to the development and progression of breast cancer. Ross enjoys writing, reading, swimming, and traveling.